Thanks, Sunshine! And just to emphasize how doing just a little can have a big impact, a TIME article about how as little as 10 minutes of exercise per week may be enough to extend your life! Suze-Q, thanks for this article. I feel like it is about all I am getting right now - if you count out the housework. Virginia, you may not count your steps, but when you are out running errands, you really pull in a LOT of steps! Since my pedometer is on the fritz and I've become quite good at counting and averaging my steps, I am confident that you have a healthy overall step count, and do a lot of muscle work when you are doing housework or carrying and bringing in your groceries. So, I truly don't think you need to worry about it. I suspect you increase your heartrate often and thus, exercise your cardiac function on a regular basis. This is demonstrated by your blood pressure, which I think was well in a normal range. You also had a nice low heart rate. You have lived your life with exercise and movement being incorporated into daily living. I clearly see that. I don't think you need to worry at all, you remain active and go above by adding extra exercises in, too. this article made me feel better about my minimal walking. Not to sound morbid, but I don't want to extend my life. Suze-Q thanks for helping me to feel better about what I DO NOT and DO get done. Right now I am fighting the dizziness. Thought I was going to be better today and then reached up into a kitchen cabinet for a saucer and had to grab the counter top for support. Took me awhile to get calmed down. I am still trying to give the Flonase a good try because I have had allergies and also because the lady I saw in the Doctor's office wanted me to. If things are not much better by first of next week I will give her a call. Howie, you already know how many telephone calls you get when you do not report in. Therefore, you know how badly you would be missed. There are many who care about your life. I wish you had a another cat, more precisely a kitten to take care of. It would not replace Sam but still I think about how good you are with cats and it would definitely have a good home and a lot of love. Not to sound too henlike but Sam and quite a few people on this board are voting in favor of trying to extend Howie's life anyway. If you keep up this kind of talk, Howie, a load of kittens is apt to turn up on your doorstep. It's the season for them. I do love cats, but Sam is going to be my last. I don't want a cat that outlives me. No one could love them and take care of them like I do. 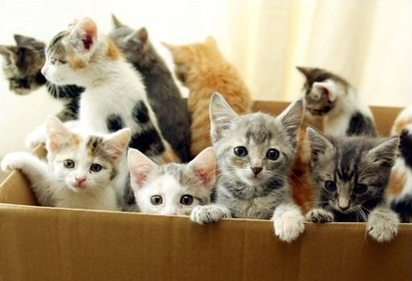 Well, just wait until you see the shipment of kittens. And they're FREE. Wouldn't one of these make a nice companion for Sam?